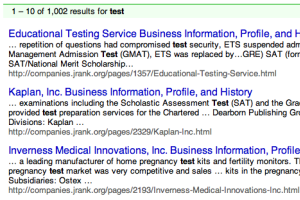 JRank provides a beautiful, simple, and clean look for your search results. However, we also provide an extremely simple REST API for custom search results to plug into your application, blog, or website. Simple, uncluttered search results. Help your visitors find what they're looking for quickly and easily. Searches are always extremely fast and accurate. More advanced features are available as well, such as proximity matching, title or body filtering, and more! 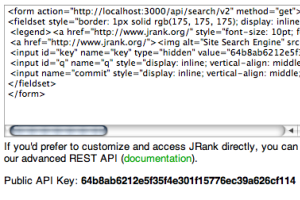 JRank organizes your websites into contexts. Each context is controlled by a set of rules your specify. Divide one website into many parts or group many websites into one site search. It's all up to you! Add or remove rules to manage which pages show up in your website search. 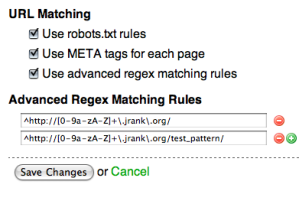 You can choose any combination of the most popular methods: robots.txt, meta tags, or even advanced Regex pattern matching. Tired of unpredictable crawl times and refresh schedules? Make sure your site search is as fresh as your website with precise crawler control. 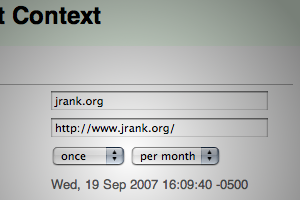 JRank's context control panel lets you control many aspects of your Site Search Engine. Schedule the crawler, view statistics, and customize the name all from one easy screen. All that is needed to setup our site search engine is copy & paste. Just highlight the widget code we provide, paste into your website, and you're all set!